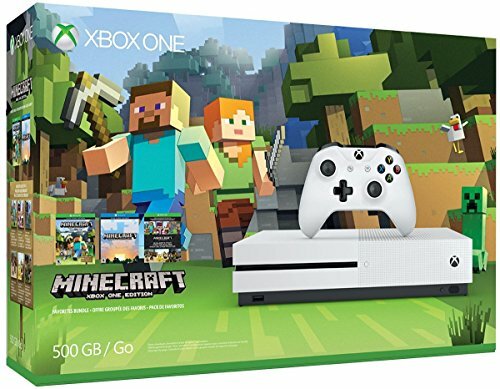 The Xbox One S Minecraft Favorites Bundle (500GB), featuring everything you need to build, create, and explore! Get full game downloads of Minecraft for Xbox One and Windows 10, plus thirteen fabulous, community-favorite content Packs, including Halo Mash-up and Festive Mash-up. Craft new Minecraft worlds together with friends on Xbox Live, the best community of gamers around the world. 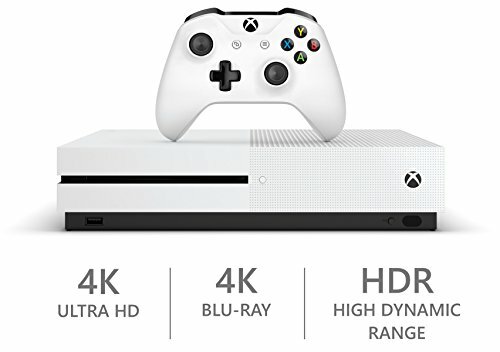 And now with the new Xbox One S, you can even watch 4K Blu-ray movies, stream Netflix and Amazon Prime in stunning 4K Ultra HD, and play a growing library of Xbox 360 games. With all the biggest blockbusters this year, there’s never been a better time to jump ahead with Xbox One.Includes: Xbox One S 500GB Console, full game downloads of Minecraft for Xbox One and Windows 10, Xbox Wireless Controller, HDMI cable (4K Capable), Power cable and 14-day Xbox Live Gold Trial.